Phryne Fisher is bored. So when she is asked to investigate some strange goings-on in Farrell's Circus and Wild Beast Show, her curiosity gets the better of her. Stripped of her identity, wealth and privileges, Phryne takes a job as a trick horse-rider, wearing hand-me-downs and a new name. But what connects the circus with the particularly nasty murder in Miss Witherspoon's house for paying gentlefolk? Or with the warfare between rival gangs on Brunswick Street? Piecing together the fragments from the seedy underworld of twenties Fitzroy and the eccentric life under the big top, Phryne proves her mettle yet again aided only by her wits, an oddly attractive clown, and a stout and helpful bear. The Honorable Phryne Fisher is feeling somewhat bored with her life. Yes, she is wealthy with a steady stream of beautiful young men to keep her company, and lives a very glamourous life during the Roaring '20s but it doesn't seem to be enough. When she is approached by 3 members of Farrell's Circus and Wild Beast Show to investigate the mysterious goings on at the circus, including the death of one of the circus freaks in a Brunswick boarding house, Phryne leaps at the chance to go undercover at the circus. She becomes one of the trick riders, the young women who stand on the back of the horses and perform tricks. Phryne has long been somewhat impulsive, and this decision is certainly an example of this, because for Phryne to fully investigate exactly what is going on at Farrell's she needs to go deep undercover, and that means that for the first time in many years Phyrne is going to be by herself. No servants, no friends to help her out if she gets in trouble, and it is inevitable that she is going to do so. This book was a little different than the usual Phryne Fisher mystery. 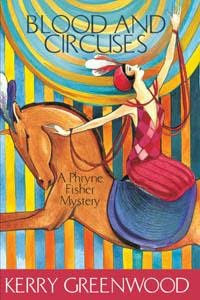 This book is more about the life of the circus performer and about Phryne being by herself than the mystery itself. For example, Phryne doesn't get directly involved in the murder investigation. She is more focusing on the circus and why a string of things have gone wrong. There is quite a lot of emphasis on the different social levels within the circus with the performers not meant to fraternise with the 'carnie' workers. I did enjoy seeing Phryne show a more vulnerable side to herself, and found the ending to be a very interesting finish to another fun Phryne Fisher mystery. When I look back at the grades that I have given to all of the books I have read in the series so far, the consistency of the writing and the stories told is very clear. The above cover image is not the cover that I have (although I do love this whole series of covers for the rereleases! ), which I can't find a picture of anywhere! It seems to be quite a common problem for me with this series because there are a couple of others that I haven't been able to find anywhere as well. Oh well. I do think these ones are much prettier than the versions I have so I won't go the bother of scanning the covers or anything like that. Hi Eva! The first couple are a bit short, but they end up being average size paperbacks in the later books.